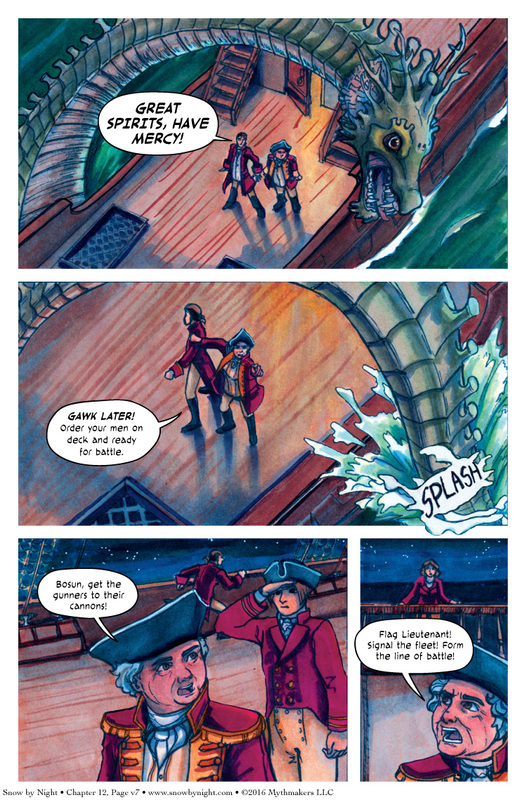 The leviathan puts on a display of intimidation on Page 7 of Serpents in the Water. Madame l’Admiral is not impressed. When you’ve been at sea as long as she has, it takes a lot to faze her. General Sayre is pretty young and doesn’t have her experience at sea. When you vote for Snow by Night on Top Web Comics, you’ll see the Admiral’s response to the leviathan. I’m running a Kickstarter for the Tattered Weave, which is an interactive story with pets and games. Kristen Kemper who illustrated The Peacemaker and the Tree of War did the opening animation for Tattered Weave. We posted it on Youtube as well as having it on the Kickstarter. Check it out! It’s beautiful. You mean it takes a lot to faze her. Extremely common error, but of course it would take even more to phase her, and probably require breaking the laws of thermodynamics. I enjoy the storytelling. Just a couple of minor things today, though – “canons” should be “cannons,” and I assume this scene is happening at night. Because flags cannot be seen very well in the darkness, ships of that time used lights at night to pass messages. The “Flag Lieutenant” could easily be responsible for both flags and lighted signals. This is my first comment here, since it’s the first time i am reading it outside a cellphone and the beatifull layout inspired me to do it. Just to say that you have a charming storytelling. All the artists in this webcomic from the start to now have been incredible. Please keep this amazing work and sorry for any grammar errors, english isn’t my first language.